I was watching some TV when they talked about a fugitive criminal who had raped few women a decade ago.To this date,police have not found the culprit. Now, they have reopened the case and are asking the community for help and if the tip leads to the apprehension of the crimnal,there is a huge monatery reward. As a christian,if you knew the whereabouts and identity of the aforementioned criminal,would you turn him in? As Christians we are subject to the law of our countries, and it is to be understood in a general sense as being a gift from God to preserve society in order. There is no need to claim a reward. If the person is a criminal then he should serve the rest of his sentence. If he is a suspect then he should be tried by the courts. To do nothing is to participate in his evading justice and is to become a criminal ourselves. To make things interesting - what if this criminal was a your brother and he repented and now wants to become a monk and live in solitude. You can tell he is sincere because he has sold all that he has and given it to the poor. . .what to do then? He's still under the law. If he truly repented, he wouldn't worry about being judged by the jury and the judge and if he was sentenced to prison, he would probably find a great deal of solitude there to practice monastic life. That's great if he repented but that doesn't entitle him to escape the consequences of his actions on Earth. Hope that helped and correct me if I'm wrong. Yeah but he has always wanted to be a monk and just made one mistake (he accidentally killed someone by giving her the wrong medication) and the police think it was premeditated. He will go to jail for life and probably be abused by not so nice big buff guys. He is your brother and he doesn't want this and you love him dearly. You know for a fact that once in jail he will be too weak and might lose his faith. Do you turn him in or let him go? Wow, that's really a difficult case. If the same person were to confess their crimes to a priest, would he absolve him or does he withhold absolution and first require the penitent to surrender to authorities? If the person was my own brother as unworthy1 an Godlovesme suggested, but unrepentant, should I still report him? The Catholic church ,including the Pope himself has been shielding abusive bishops for many years.Were they being unchristian? Haha, I think I opened a 'can of worms'! We can come up with a million different scenarios but the main thing is the person is being unjust in evading his sentencing. I was just trying to highlight that when the person is close to you and the crime seemingly accidental it is difficult to turn them in. When we are detached from the person it is a no-brainer. Picking up the phone and calling the police to tell them where your brother is so that they may arrest him is one of the most difficult things to do. But the law does not require us to be 'good samaritans.' If your brother, or close one, resists arrest all you can do is advise him. This is funny because I talked about something similar with two young kids at my church. One of them did something wrong on the bus. The bus driver asked his friend whether he did it. . .he told on his friend and he got suspended. I wasn't sure what to tell him. On the one hand he lies, on the other his best friend gets in trouble and upset with him. these are all interesting scenarios... if my best friend/ brother/ sister, committed wrong, I would talk them into turning themselves in, but remember we are not of priesthood to withhold a confession, if we were priests and a person comes and confesses their sin, we would not be able to say anything from the confession. as lay people, as father Peter mentioned we are to abide by the law, if you know something, you can choose to withhold it if you choose, but YOU CANNOT HELP THE CRIMINAL!!! so if the one person is repentant on what they did, to the point that they want to seek monasticism, then they trust in God, to the point that they will give all their lives to God, so if I'm wrongly accused, then I will trust in God and His will, no matter what happens, actually I address that in my most recent story, "in prison free"
but on the other hand, lets say we went ahead and trusted that person, what if that person does another crime? how would you feel, what would you do? are you ready to carry such a weight on your shoulders? now if you want scenarios, there is a story that was made in Egypt in the mid/early 1900s (which through the grace of God, I will try writing and making it as play) its about a person who committed murder, and went and confessed about it, and the priest couldn't turn him in, and this person was a friend of the priest's son, and the priest's son was convicted, now the priest could not turn the guy in, and the person didnt want to confess, and i think the priest ended up in jail, due to the police thinking that he was helping the real killer... but through the story everyone stayed did what they can do, until God solved everything to the best. Thanks for your comments. 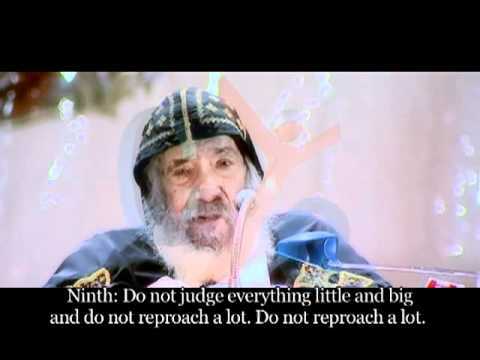 This topic reminded me of the story HH Pope Shenouda told in his sermon on forgivness about a priest who tells his wife (she donated one of his extra Jalabiya to the poor) that what he preaches in the church does not apply to his houshold, but only to the poor folks out there. Things get different,when we put our feet in someone else's shoes. My question is that if harboring a criminal is a crime under the law,and we are fully aware of that, how are we supposed to abide by the law?? Our faith is the faith of sacrifice and suffering. There is no middle ground there.So why should we make an exception ,if the wanted criminal is one of our blood and flesh?? When we confess the sin of theft, for example, to a priest ,as part of the absolution we are advised to return the stolen item and seek the forgivness of the victims.How does a priest absolve a murderer, if that criminal is not going to face , at least, the victims? How about if that murderer turns into a serial murderer, what happens then? it was a great sermon, i want to be sure everyone listened. the story about the galabeya (garment) is at the end, it's great. we should always put our good words into practice. If he were sincere he would have turned himself in. Your right Ioannas. His confession has made him a sincere man. It's not like he was baptisted and all sins were forgiven from that point on. No, his confession is only part of the debt he has to pay to leave this world in purity and rightousness. He may pay with prison time. And in that time, use it to get to GOD. Ideally, of course, that would be what he would do. But the question was never about what the person who committed the crime should do but what you should do as knowing his whereabouts. Correct me if I'm wrong, but didn't the monks hide St. Moses the Ethiopian from the authorities? If so, what makes this case different from his? For my conscience, I would tell the police, as he has connected my with his crime. Here I am. I know he has injured somebody. If I can help in his repentance, I would. If he is still running there is no sorryness in him. And if that's true. He will carry on doing what he's doing. If he doe's it again. I've let him. I don't think the Church should hide him as this would mean there would be a discord between society and the Church in the issue of repondsible action. Saying sorry does'nt mean you can hide. This is true. St. Moses did hide from local authorities in the monastery which eventually led to his conversion and monastic life. He was never punished (legally) for any of his barbarous actions. But no one would question the fact that he is a saint and will be in heaven. Let's also not forget how St. Moses ended his life. The berbers were coming to attack the monastery and he refused to flee saying, 'those who take up the sword shall perish by the sword' (in reference to his past life and the fitting end to his life). That's right, but does that compensate for his evading the authorities? He never turned himself in. Who knows if he could have escaped. Maybe he saw his fate was inevitable and accepted it because he knew it was a just end. But what is the correct christian action then? Do we say,let God take care of the situation or do we have to fulfil what the law requires of us (without bias)?